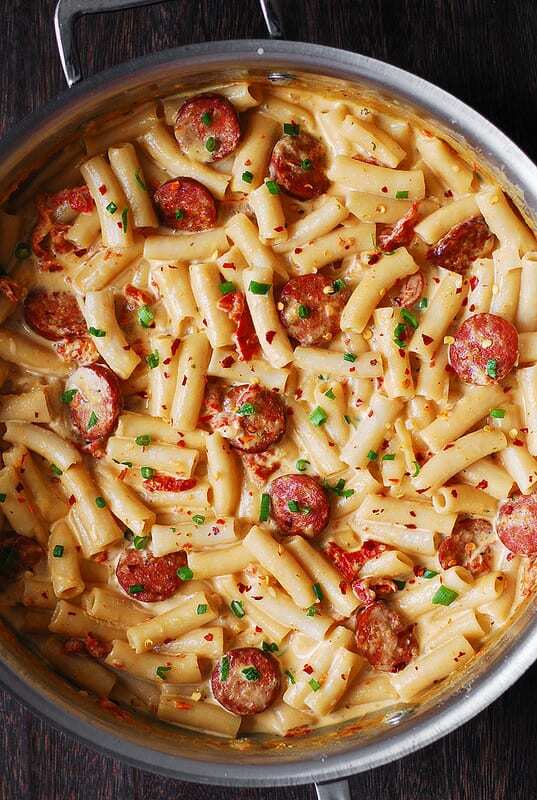 Creamy Mozzarella Pasta with Smoked Sausage – Italian style pasta dinner that looks good and tastes great! 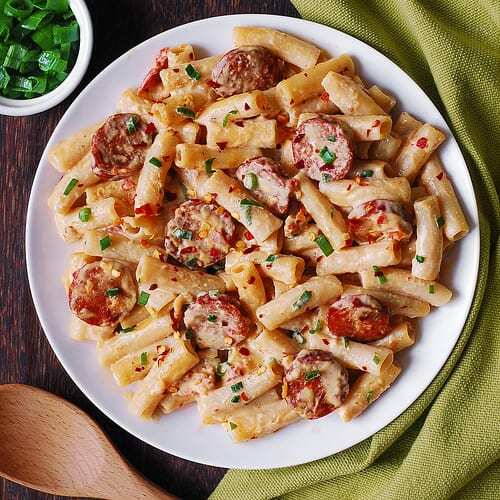 Short penne pasta with thinly sliced smoked sausage are smothered in a delicious creamy sauce made with garlic, sun-dried tomatoes, red pepper flakes, half and half, and Mozzarella cheese. 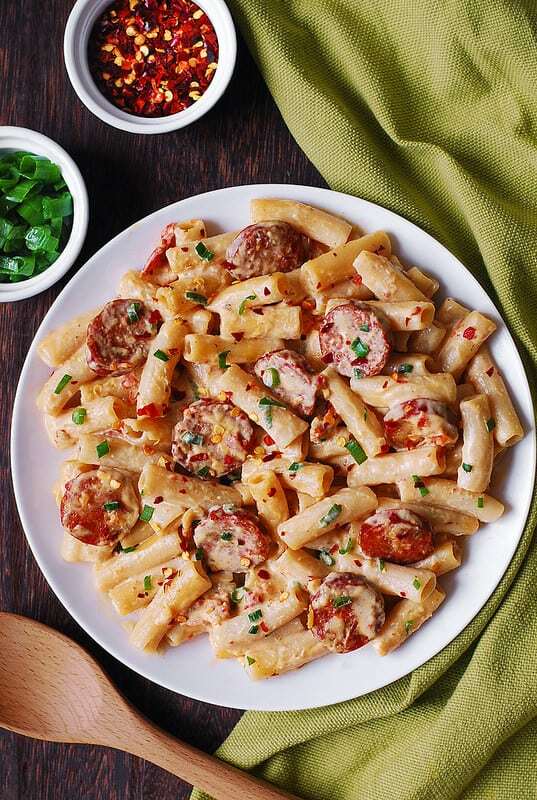 This creamy sausage pasta is a great recipe to try with the savory smoked sausage. The recipe easily feeds 4 people, or makes an easy weeknight dinner for two, with leftovers for next day’s lunch. 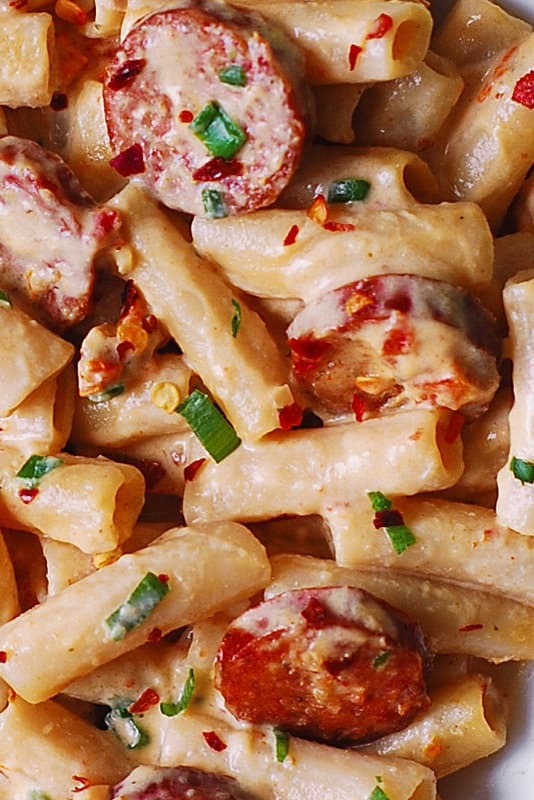 What makes this smoked sausage pasta especially tasty is that first you cook sliced sausage for about 4 minutes, letting it release juices, and then you incorporate these juices into the creamy sauce, making the pasta dish spicier and more flavorful. 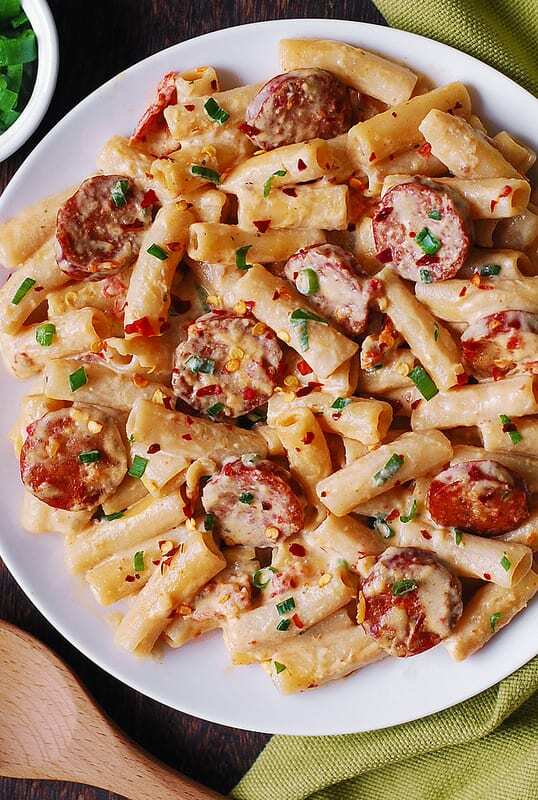 Creamy Mozzarella Pasta with Smoked Sausage - Italian style pasta dinner that looks good and tastes great! 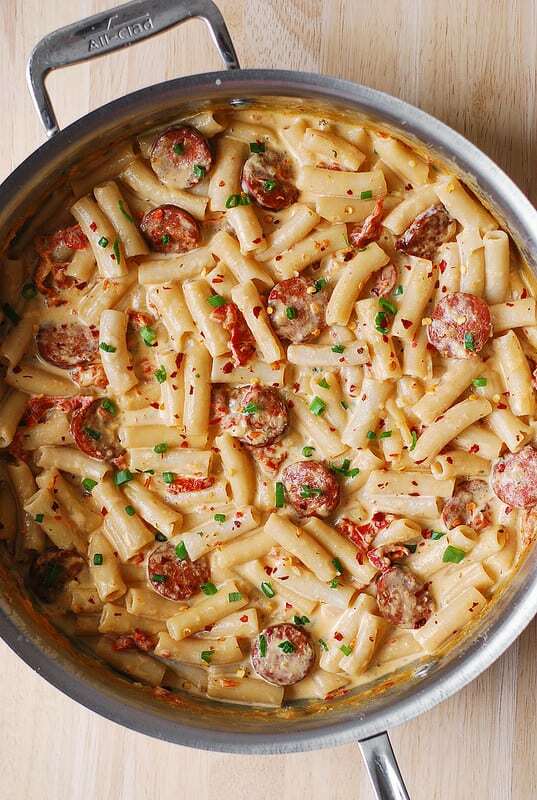 Short penne pasta with thinly sliced smoked sausage are smothered in a delicious creamy sauce made with garlic, sun-dried tomatoes, red pepper flakes, half and half, and Mozzarella cheese. Heat olive oil in a large skillet on medium-high heat. Add sliced sausage, cook for 4 minutes, about 2 minutes on each side. Sausage will release its own juice. Remove sausage from the skillet. To the same skillet, add chopped sun-dried tomatoes and minced garlic. Cook for about 1 minute, constantly stirring. Add half and half. Bring to boil. Add cheese, reduce heat, and keep stirring until the cheese melts. Bring heat to medium, if needed, to melt the cheese, then reduce to simmer. Add cooked and drained pasta and sausage back to the skillet with the sauce. Stir. Add pepper flakes. Note: I did not have to add salt, as the smoked sausage is already salty and provides enough saltiness. Add salt to taste, if needed. WHAT IS HALF AND HALF? Half and half is half milk half cream. To make 1 cup of half and half, combine 1/2 cup milk and 1/2 cup heavy cream or heavy whipping cream. Great recipe! I used hot Italian sausage and diced fresh tomatoes… and added some oregano when sauteing the tomatoes and garlic. 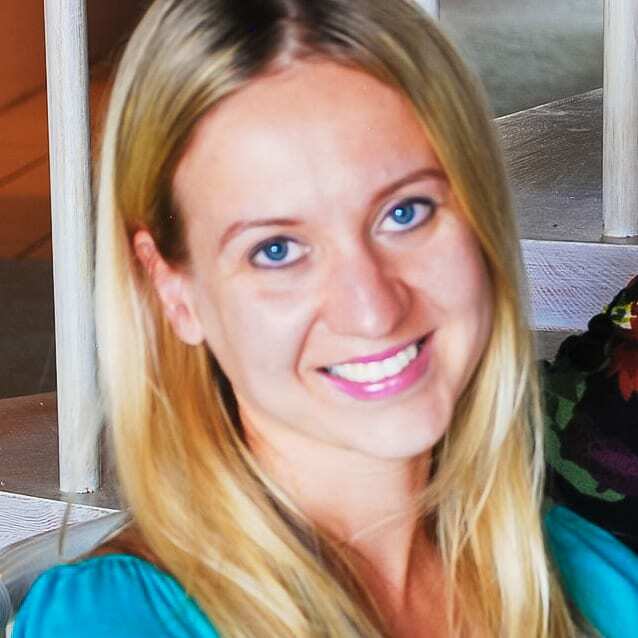 My kids are picky eaters and loved it! I made this, it was tasty! Though my sauce turned out colloidal looking not really creamy. Next time I think I’ll do a rouge with flour and add the half n half..see if that makes a difference! Thanks for the recioe!! You’re very welcome! I am glad you liked it! What kind of cheese did you use? Shredded Mozzarella? This recipe is a gem! was looking for something to cook, easy, open a can of ravioli and heat them up, but my daughter – which can eat pasta every day said – “surprise me” so I did. so used chopped half onion.had smoked sausage in the pan with a bit of olive oil. Did not have the dried tomatoes, but chopped some cocktail fresh tomatoes. added them in the pan before adding grated old cheddar – one yellow one white, different vintages. did not have cream but used whole milk 3.8%. boiled pasta a bit beforehand, and added even more grated parmigiana towards the end for thickness. it turned out to be a blast. Thanks. You are very welcome! I am glad you enjoyed the recipe! Your additions and substitutions sound delicious! Love that you used grated Cheddar and extra Parmesan, as well as fresh tomatoes. Can you use buttermilk instead of half and half? No, you have to use half-and-half or heavy cream. Use 1/2 cup of whole milk + 1/2 cup of heavy cream to replace 1 cup of half-and-half. Would have been helpful if you put the 1st step as cooking the pasta. I made this super quick after getting home late from work and had already had the sauce all good then saw the pasta was already supposed to have been made. Not a huge deal but if it’s separate and not cooked in the sauce it’s helpful if it’s stated ahead of time. If your sauce got too thick while you’ve been waiting for the pasta to cook, you can easily thin it out by adding cooked pasta water. Love this recipe! Next time will do only 2 cloves of garlic tho! You can use 1/2 cup of whole milk + 1/2 cup of heavy cream to substitute for 1 cup of half-and-half. A note on half and half – it has 10% to 12% fat content – half (whole) milk (3.25% fat) and half light cream (18% fat). If you use heavy cream (36% fat), you end up making light cream. Which is fine, since light cream is hard to find in the store these days, but the fat and calorie content will be higher than if you use half and half. If you use heavy cream, mix 1 part with 3 parts milk.